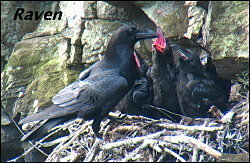 We have just had a week on Islay and succeeded in filming Ravens feeding their young. For those of you who do not know Ravens are one of the most difficult birds to film at the nest as they are very intelligent and extremely wary. Whilst they are not popular with farmers from a photographers point of view they are the ultimate challenge. In forty years these were only the third that I have filmed at the nest. A lot of time has been spent looking for Woodcock and although we flushed a bird no nest was found. Our luck with Otters has ran out and we have failed to see any , even on Jura. The highlight of the week has been the numbers of Hen Harriers and Short Eared Owls. On one occasion we watched a Short Eared Owl catch a vole then have it taken from it in mid air by a male Hen Harrier. A flock of fifty three Black Tailed Godwits in full breeding plumage was a magnificent sight. There are now many waders passing through Islay with Whimbrel, Dotterel, Long Billed Dowitcher, Spotted Redshank and Lesser Yellowlegs the highlights. This male Long Eared Owl in the photo was found roosting by his incubating female on Easter Saturday and looked quite proud to be protecting her while she incubated the eggs in an old Magpies nest. Their world was turned upside down the next day when youths pitched three tents under their nesting tree and resulted in failure of breeding for this year. In another plantation near Oldham the same thing happened and another pair of Long Eared Owls failed. The lesson, of course, is that good weather when Easter falls in April can be a disaster for our local breeding Owls – not just Long Eared but Tawnys as well. Next year Easter does fall again in April so lets all hope we have four days of pouring rain – if only for the benefit of our breeding Owls. It is good to hear Blackcaps singing in the woods and we now wait with trepidation to see if any Wood Warblers return. Further to last weeks blog the real reason to visit the Northern Dales was to wait for a perfect morning to film lekking Blackcock. 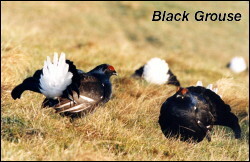 Well it came along and I entered my hide at 4am in total darkness.By 5am the valley was alive with the calls of Waders and by 5.15am the first Blackcock flew into the lek. It was nineteen years since I filmed this lek and I had forgotten how awesome the calls of lekking Blackcock were as it came light. I was treated to fighting males in front of me. When the sun came up their colours looked even more immaculate. In all the fighting I failed to see a female but I am sure they did! At 8.10am they all flew off and the spectacle was over with for that morning. It was a great deal of effort but the performance of the birds and the weather had been perfect and over half an hour of video was obtained of which I will have to find the best minute for my Pennine DVD. In wildlife filming not everything goes according to plan , I was in position to film a scene in Bowland, the sounds were perfect with Curlews and Lapwings calling on the moors. I was about to start filming when more than a hundred motor bikes came over the hill and drowned out all the calls. It was twenty minutes before everything returned to normal and I could finish the sequence! A big effort has been made to find Woodcock and finally today an off duty bird was flushed. Despite a thorough search no nest was found but I will bet the female was down on eggs somewhere. I may have to return with my Golden Retriever to seek some canine help! In the last week there has been a massive influx of migrants with Willow Warblers singing everywhere. The last two days have also produced Redstarts, Blackcaps and a male Pied Flycatcher in full song by a nest box. Along the river Hodder a fresh spraint from an Otter was a good indicator of their presence and on the same day two Hares boxing were the first I have seen doing this. Amusingly I also came across a Hare sat three foot off the ground in the fork of a tree. In the hills a female Merlin was back on her nesting territory and the spectacle of a hunting male Long Eared Owl at dusk was one not to be missed. It’s all beginning to happen now. Good weather has returned this last week and I have spent two days in the Northern Dales filming waders including the Snipe on the blog. It was amazing at dusk and dawn to see and listen to displaying waders that included Woodcock, Snipe, Redshank, Lapwings, Oyster Catchers and Curlew. Many of our local hills had these waders thirty years ago before overgrazing led to their disappearance. An outing one evening this week resulted in a male Long Eared Owl being seen carrying prey to a female and there was some vocal activity. It was good to see the return of Wheatears to the hills. Searches for the Lesser Spotted Woodpeckers have drawn a blank on two occasions and I now fear that this tiny illusive bird has been lost to the areas I have known for a lifetime. In the garden Reed Buntings are the stars and we must have at least half a dozen different birds now feeding at different times.